Home > Blog > Textbooks – Time to Lease Instead of Buy? Textbooks – Time to Lease Instead of Buy? One of the most expensive and at times frustrating aspect of the college scene is the biannual semester book purchase. Long lines and big outlays for books that you are afraid to go without yet may use very little make the process a very negative one for students. If you find the process more than you can stand or the cost prohibitive, then you may want to take a peek at a new concept and a new site, Chegg.com. Leasing textbooks is exactly as it seems: college students may rent as many hardcopy textbooks as they might need for the upcoming semester or year. By renting books instead of purchasing, students immediately reduce the overall cost burden of this aspect of their education. In some cases, the savings can be as much as 80%, especially if a text is brand new. Students may also select the needed books online from their own computer and then have them delivered directly to their dorm room or apartment. No waiting in long lines just for the chance to spend gobs of money. A Santa Clara, California-based company, Chegg.com is one such marketplace for renting textbooks online. The concept is considered so forward-thinking that the company recently raised $25 million in investment funding from a number of high profile venture-capitalists. The additional financing will enable the company to pursue an aggressive growth strategy. With the funds, the site will be able to provide enhanced services including the expansion of its textbook rental catalog. Adding to the Chegg process, students may also purchase texts from the online site. Students will also know at the time of purchase what they can expect for a possible cash return should they decide they do not want to keep the text. The company, founded in 2005, understands the concept is a green issue as well. Clearly, over time the number of books being produced and wasting away on shelves will be reduced saving countless resources. At the same time, to reinforce an environmental message, Chegg plants one tree for every textbook rented. Since getting the textbook leasing option underway, the company has planted over 150 city blocks worth of trees. There could well be books that students do want to purchase as they could be potential future resources while on the job. Texts in courses related to one’s major may not be ripe for the leasing process. However, the ability to both purchase or lease online means that Chegg is a site students should definitely consider. While the influx of capital should greatly enhance their library of text offerings, Chegg currently offers over 1 million books to choose from. Students looking for a better process and cost savings may want to pay Chegg.com a visit prior to making their spring semester book purchases. Flickr photo courtesy of wohnai. 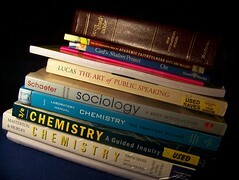 I have never heard of Chegg, but I recently rented my textbooks online from a company called Bookswim.com. They normally rent regular books, but they started offering textbooks as well! I have been using their service for a little over a year now, since I received a gift card for my birthday. Since then, I have saved so much money by renting my books instead of buying them… They just started offering textbooks as well, which is awesome, since each of my nursing textbooks are really expensive. This gives me a way to borrow the books that I need and return them when I am done. If you haven’t heard of them, check them out! Well researched. I’m interested in the whole ‘rent to buy’ process over here in Ireland. Chegg really is an amazing company. I’m pretty sure their the only company out there that plants a tree every time you rent buy, or sell a book through them. Definitely the lowest priced rentals on the web and best service out there. « Classic Retro Games You Can Still Learn From Today!